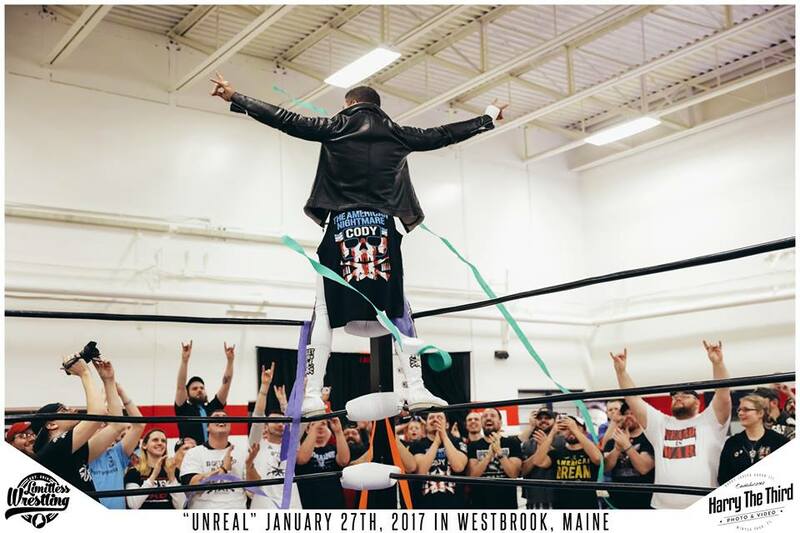 ORONO, ME- In a little less than a year and a half, Limitless Wrestling has grown to be one of the biggest wrestling promotions in the state of Maine. This Saturday, February 25th, they make their long awaited return to the greater Bangor area. Limitless Wrestling returns to the American Legion Post 84 in Orono. This card includes matches like Xavier Bell vs Alexander Lee, the team of DangerKid and Aiden Aggro, “The Maine State Posse” vs the team of Ace Romero and Anthony Greene “Take Me Home Tonight”, Tyler Nitro vs former WWE Cruiserweight Classic competitor, Anthony Bennett, and JT Dunn vs Lucha Underground superstar Sami Callihan. Owner and founder of Limitless Wrestling Randy Carver says that Dunn vs Callihan is the match to watch at this Saturday’s show. JT Dunn is one of the hottest superstars in Limitless Wrestling right now, coming off of a huge win against former 2 time WWE Intercontinental Champion and 6 time WWE Tag Team Champion Cody Rhodes this past January at “Unreal”. With Sami Callihan making his Limitless Wrestling debut, Dunn might have his hands full. “JT has been a hot commodity for us though, snagging some big victories against The Maine State Posse & most recently, Cody Rhodes. Ultimately though, I’m not sure if he, or if anyone can keep up with the vicious “Strong Style” that Sami exhibits inside the squared circle,” Carver says about the match. This card includes Limitless Wrestling originals including Ace Romero, DangerKid, Anthony Greene, Alexander Lee and Xavier Bell. This makes the homecoming even more exciting. “It’s home, so to come back after a three month absence with a unique and fun card like this is something I’m very much looking forward to,” Carver says about Saturday’s show. Limitless Wrestling returns this Saturday, February 25th at the American Legion Post 84, 156 Park Street in Orono. Doors open at 7:00 p.m., with a bell time of 7:30. Tickets are available at https://limitlesswrestling.com, and will be available at the door. Limitless Wrestling also returns to Westbrook on March 17th with “Hysteria”, headlined by former WWE Tag Team Champion and 2 time IWGP Junior Heavyweight Tag Champion Matt Sydal, known in the WWE as Evan Bourne, vs 2 time IWGP Junior Heavyweight Tag Team Champion, 2 time Lucha Underground Champion and the winner of the 2014 Best of the Super Juniors tournament Ricochet. Tickets are on sale at https://limitlesswrestling.com. VIP and front row tickets are both sold out, general admission tickets are $15. Doors open at 7:00 p.m., with a bell time of 7:30.